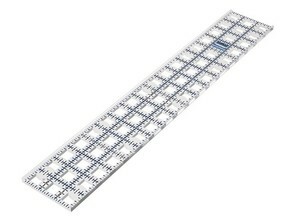 TrueCut Ruler with the TrueCut Ruler Track. the guide on the TrueCut cutters interlocks with this raised edge, giving you straight and precise cuts. Labeled 30, 45, and 60 degree angles. Built in marking holes and easy to see colors. Ruler measures 3x18 inches.